As the world didn't collapse on 12-12-12, we have no excuse but meet again in Zagreb for the next ICORIA! The EAA, and especially Ivana Bušljeta Banks of Zagreb School of Economics and Management, is enjoying the organization of our next conference. The previous conference organizers, Sara Rosengren and Micael Dahlén, are still busy in publishing the best 2012 papers in EAA’s Advances in Advertising Research Volume IV (2013). We wish you all Merry Christmas, peace, happiness and a lot of academic spirit in 2013! As you already know, the 12th International Conference on Research in Advertising will be held on June 27-29, 2013 at the Zagreb School of Economics and Management (ZSEM) in Zagreb, the capital of Croatia. The conference theme To Boldly Go... Extending the Boundaries of Advertising embodies the current trends in both traditional and non-traditional advertising research and practice, as well as the expansion of the conference itself to new territories. Here at ZSEM we are all happily busy preparing and excited to host you during what promises to be an excellent meeting of the greatest academic and professional advertising minds. We look forward to both the academic and social events of the conference, filled with the best of current research discussion, as well as good food, wine, a few witches, and tales of the old Zagreb. Don't forget to submit your paper at papers@icoria.org by March 15, 2013. If you would like to read some fresh-out-of-the-oven papers and learn about new research findings before anyone else, sign up as a reviewer at ibanks@zsem.hr. The 2013 AMA Summer Marketing Educators' Conference will be held at the Boston Copley Marriott Hotel on August 9 – 11, 2013. Shintaro Okazaki (Universidad Autónoma de Madrid, Spain) and Martin Waiguny (Auckland University of Technology, New Zealand) will co-chair the Promotion and Marketing Communications Track. They would be grateful if you could serve as a reviewer. To sign up as a conference reviewer, please visit the AMA conference web site. The co-chairs invite you to submit a competitive paper, poster or a special session proposal for Advertising, Promotion and Marketing Communications Track. The submission deadline is January 28, 2013. 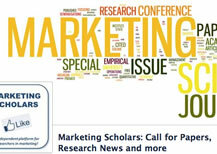 The Call for Papers and registration information can be found at: www.marketingpower.com.